May 12, 2015, 2:00 PM · This past year, it became clear to me that many of our students were in need of a high level chamber experience to supplement their solo work with me in the studio. While we already put a lot of emphasis on sonata literature and encourage chamber orchestra and recreational chamber music with fellow musicians, this was different. This would involve coaching with three teachers, a curriculum, performance opportunities, and even competitions. I took a large part of the summer researching different chamber programs for pre conservatory students around the country. I also took some time to reflect on the training I received as a chamber musician both before and during my days at the Paris Conservatory. For me, chamber music started early with parents in the house who were both accomplished musicians. They were both Ministers of Music in churches in our area so we played in services together, created descants for me with choirs, and had me participate in small chamber ensembles hired in for Easter and Christmas. My scholarship for private lessons when I was a preteen required me to do a chamber course and play in trios and quartets with Grad students at Catholic University. I then did a full summer of string quartets before I left for the Paris Conservatory at 15. By this point I had fallen in love with sonata repertoire too. Playing with others is such a crucial skill and it might seem like an obvious one. For me it seemed already present in the way I was raised but what about the talented students who do private lessons and youth symphony orchestra once a week? It is hard to describe to parents why it is that something that seems less obvious than a concerto could be so influential to their child's development. While studying and performing solo literature is obviously very rewarding and exciting, there is such value in the advanced listening and collaborating skills you attain through chamber music. 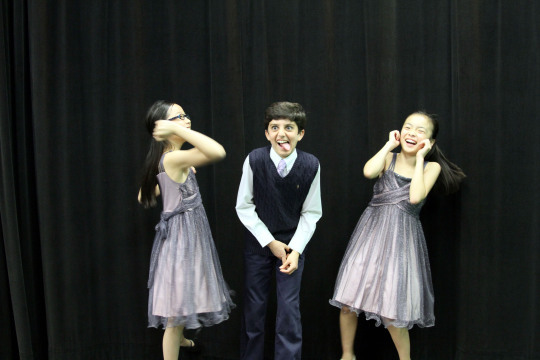 It helps to refine the ear, centers rhythm, contributes to stage presence, and promotes a peer group that inevitably serves any young musician as they grow. We had great success with our "pilot" chamber program this year. Our middle school Piano Trio, Trio Nuage, placed 2nd in an international competition enabling them to make their debut at Carnegie Hall. Now more students are following in their footsteps and I am excited for what will come. I see friendships building, joy in music making, kids meeting on their own to rehearse, and an excitement in performance that would make any teacher proud. 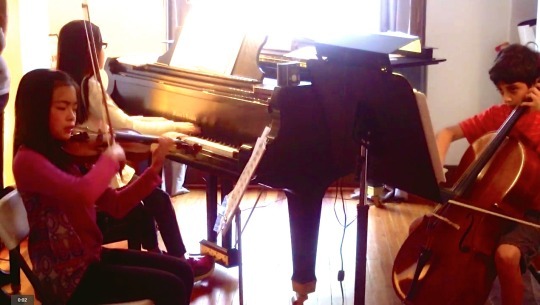 Our Elementary School Piano Trio parents reported to us that the kids go to each other's houses to hang out and then play chamber music together. Imagine my joy in hearing that! This month is National Chamber Music Month. We are thrilled to be dedicating the work we do and the many chamber performances we are presenting to National Chamber Music Month and hope others will too. 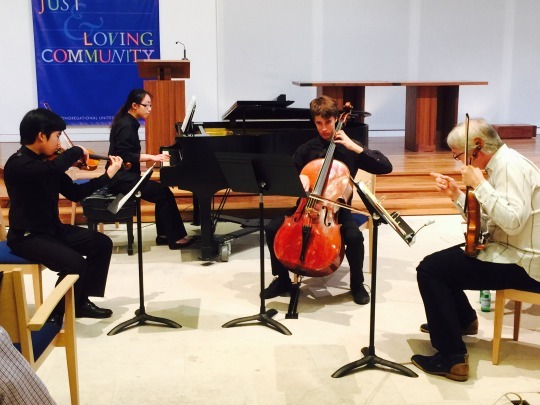 Below are some pictures of the chamber music our students have been involved in this year. We hope this inspires more kids to start their journey into chamber literature and more studios to make this a basic part of their curriculum. 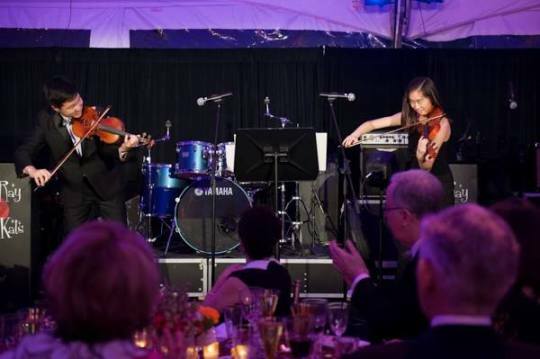 My student Sean Yongjoo Lim and Evelyn Song (student of Lya Stern) performing Sarasate: Navarra for the Strathmore Hall Gala event in preparation for their performance with the MCYO Philharmonic Orchestra and Maestro Kristofer Sanz at Strathmore Hall on May 20th! Trio Etoile: Carina Kong (student of Anna Ouspenskaya),Kayleigh Kim (HVS), Negin Mostaghim (student of John Kaboff), in rehearsal at HVS. Promo shots with Trio Etoile for fun at the taping of Classical Open Stage, a local TV show in Montgomery County, Maryland sponsored by The Potter Violin Company. Trio Nuage, Aimee Feng (student of Anna Ouspenskaya), Masato Chang (HVS), Colin Hill (student of John Kaboff), being coached at the HVS Master Class with Jonathan Carney in April. 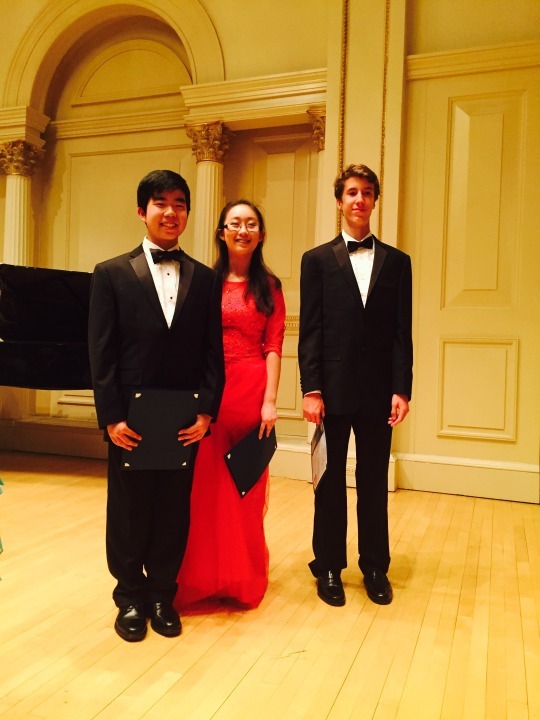 Trio Nuage after their Carnegie Hall debut performing Haydn’s Piano Trio in C Major on May 10th, 2015.